2. I was not feeling well for 3 days in this month. I noticed that when I don’t write anything for few days the number of people who subscribe to the feed of this blog goes up. Does anybody have an idea why this is happening? I have my own theory (Well I am a web analyst) but would like to hear from others. Here is the list of articles that I psoted. <Web Analytics Job Market is Hot - Update on the web analytics job market. Last month was the highest ever month in terms of open jobs since January 1st. Open Jobs in web analytics were up 68% from January 1st. Omniture was the most sought after tool experience followed by webtrends. My next update is coming tomorrow. Are you doing Web Reporting or Web Analytics? – A lot of marketers confuse web reporting with web analytics. I explain the difference between web reporting and web analytics in this post. Live from eMetrics - My quick update from eMetrics in San Francisco. eMetrics Conference in San Francisco – My second update from eMetrics in San Francisco. What does Website Optimization mean? – The word “Optimization” and “Website Optimization” means different things to different people. This article is my attempt to clarify the definition of “Website Optimization”. Hot off the press: Actionable Web Analytics – Jason Burby and Shane Atchison of ZAAZ released their first book on Web Analytics. Do you really need a home page? - This article was in response to Seth Godin, article "Do you really need a home page? Does the web respect it?". I reiterated what I had said on the similar topic last year. Future of small Behavioral Targeting Networks is grim - I think with Google, Yahoo and Microsoft all trying to build their own Behavioral Targeting Networks with recent acquisitions of DoubleClick, RighMedia and aQuantive receptively it probably does not make sense to have stand alone Behavioral Targeting networks. Behavioral Targeting: Audience of One – My views and follow-up on the Washington past article titled “Web Ads with An Audience of One” discussing the growing use of Behavioral Targeting. Google, Yahoo, Microsoft and Cookies – This article talks about how the recent acquisitions by three giants acquisition are not about ad serving technology but about user data and reach. Seth Godin, on his blog, wrote "Do you really need a home page? Does the web respect it?". Human beings don't have home pages. People make judgments about you in a thousand different ways. By what they hear from others, by the way they experience you, and on and on. Companies may have a website, but they don't have a home page in terms of the way people experience them. The problem with home page thinking is that it's a crutch. There's nothing wrong with an index, nothing wrong with a page for newbies, nothing wrong with a place that makes a first impression when you get the chance to control that encounter. But it's not your 'home'. It's not what the surfer/user wants, and when it doesn't match, they flee. You don't need one home page. You need a hundred or a thousand. And they're all just as important. I fully agree with Seth's view. I wrote similar post last year, where I questioned the undue importance marketers give to their home page (Homepage How Critical is it?). In this article I highligted several reasons why a majority of the users might never see the traditional homepage. Essentially every page is a home page (use your web analytics tool to find out where users are entering your site and treat at least the top entry pages as your home page). Below are some of the factors, that I mentioned in my post, that cause users to bypass the home page. 1. Search Engines – Visitors, now more than ever, rely on the search engines to find the sites or pages which are relevant to what they are looking for. Search engines link into internal pages not just home page, at least that’s the case for well search engine optimized SEO) sites. Note: that in response to my post last year, Joeseph Carrabis wrote a post titled Homepage as Bookcover. Today there was an article on ZDNET blog about how Google/Doublelclick, Yahoo/RightMedia and Microsoft/aQuantive deals is about cookies more than anything else. I agree with the author of this article that these acquisition are not about ad serving technology but about user data and reach. I have written in my past article about how these acquisitions by these three giants were a huge steps towards building behavioral targeting networks. The rich set of user data that these companies will be able to gather by these acquisitions is very valuable. All of these companies had cash to hire smart people and build the ad serving technology for a fraction of what they paid for acquisitions. So it is not about technology. What they could not have done on their own was the reach and rich user data. The only way to gather that kind of information was to acquire the companies which have those. So why do they need that user data? One of the issues with advertising is that by placing contextual ads advertisers waste lots of impression because they reach a lot of people who are not even interested in their offers or products. This rich user data (tied via cookie) will provide Google, Microsoft and Yahoo understanding of which users could potentially be interested in offers/products of an advertiser. Historical user data will allow them to understand what kind of users have responded to what kind of offers/products in past. The new acquisition will also allow them to reach all those user which were earlier not in their network plus provide them more data. This will allow them to target the ads to right set of users, users who are most likely to click on an ad and convert (buy, register etc.). By generating higher click-thorough and conversion they can command premium from advertisers. Everybody benefits from this, publishers can sell their inventory for a premium, advertisers will reach right set of customers and consumers will get the offers and products they care about. The three giant (Google, Microsoft and Yahoo) make money by providing this rich data and hence taking their cut from publishers (in many cases they will also act as publishers). Some might argue that cookie deletion will cause a problem in aggregating the past user histories. I agree that cookie deletion is an issue but all these companies have some way for user to login or provide their real information (gmail, hotmail, yahoo mail, google checkout, toolbars, messengers etc.) which can help them tie all the cookies together. I will blog about this more in my future article. Another issue raised by this article was privacy. I have written a lot about this in past, here is link to my past post which talks about this issue Behavioral Targeting: Audience Of One. Behavioral Targeting will become a norm (it already is) and these three giants will own (already do) a significant portion of that user data that will make it possible. 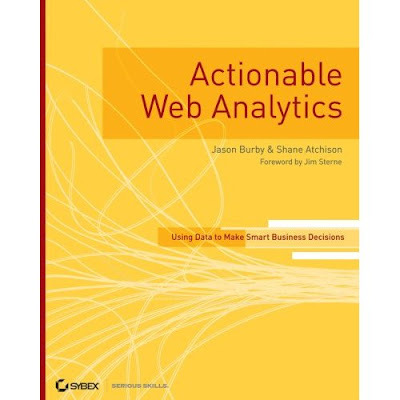 Actionable Web Analytics by Jason Burby (my boss) and Shane Atchison (CEO, ZAAZ and my boss’ boss) is released today. I got my copy from Shane today, I will write my review after I finish reading the books. I expect this book to be a great resource for marketers. I am not saying this because I report to them but because I know how passionate both Jason and Shane are about web analytics and have years of experience helping companies unleash the power of web analytics. Visit Amazon to Buy Actionable Web Analytics. This morning Washington past had an article titled “Web Ads with An Audience of One” discussing the growing use of Behavioral Targeting. Behavioral Targeting since I started this blog and have been predicting growth of behavioral targeting. MSFT/aQuantive deal did not come a s a surprise to me, I expected it. Behavioral Targeting is going to be very prevalent especially now when all three MSFT, Google and Yahoo have built their capabilities are building them. This article resurfaces the privacy concerns, as I wrote in my article Google Doubleclick Deal concerns Privacy Advocates the best way to deal with privacy is to move from opt-out to opt-in model. …. "I believe that if consumers are provided proper education (I will write about consumer benefits in one of my future posts) than they can infect benefit from Behavioral Targeting. It will be a win-win situation for all the parties involved. Proper education and disclosures by advertisers, publishers and networks will ease the concerns regarding Behavioral Targeting. Consumers have the right to opt out of Behavioral Targeting but what is lacking is proper education on how to do so. The networks currently opt-in users by default; however, in my opinion the proper process should be opt-out by default and opt-in if user chooses to opt-in, just like we do for emails and newsletters. This process will move the burden from users to the advertisers, publishers and networks. This article gives an example from DrivePM where a user who visits a hotel chain site but does not complete the booking can be reached at later point in time but this time the user gets a 10% off coupon as an incentive to complete the booking. Knowing the benefit won’t users allow networks to track them? I am sure those who see the value in this 10% will surely do. As I said above give users what they want and they will give you what you want. If users know that they can have offers tailored to their needs by just letting a network track them, chances are very good that users will let them do it. Users sign up for grocery card rewards program just to get few cents off then how is it different online? Let users decide what and how they want you to track. One another note: I am puzzled by the quote from Curt Viebranz of Tacoda “…….. we’re literally collecting 10 Billion behaviors a day”. In my article titled Calculating Behaviors on your Site I questioned a similar quote from Revenue Science. Can somebody from Tacoda or Revenue Science please clarify how you calculate behaviors or quit using such meaningless stats. Behavioral Targeting Moves by Yahoo and Google and Google and Behavioral Targeting) With such large networks in the market does it make sense to have standalone behavioral ad networks such as Revenue Science Tacoda? These networks don’t even have their own ad serving system they just provide the technology to identify segments and then rely on other ad servers like double click or atlas to serve behaviorally targeted ads. Google/Docublick, Yahoo/RightMedia and Microsoft/Aquantive all have or are building behavioral targeting capabilities (technology) plus they have the reach. I believe Behavioral Targeting will become important but advertisers are long ways out from just relying on behavioral targeting. Behavioral Targeting is one part of the whole targeting mix. With Google, Yahoo and MSFT with their vast reach further strengthened by these acquisition do not need smaller behavioral targeting networks (with limited reach) when they can do it own their own. Advertisers/Agencies also don’t need to worry about several smaller networks when they can use one of the exiting ones such as Google, Yahoo or MSFT. Continuing my series of interviews with Web Analyst here is an interview with Daniel Shields. I am currently employed by CableOrganizer.com, a South Florida based eCommerce business dealing in wire-management products. (It has recently been brought to my attention too that we have been named a company which has risen into the ranks of the Internet Retailer Top 500.) I am keeper of the Analyst title, which implies marketing as well as web analytics. As a smaller company, many of us have to wear a couple of hats. It just happens to be that I end up straddling the fields of marketing and online marketing. I'm sure that's pretty common. While my job, in its current state is only technically in place since January of this year, I have been practicing analytics, in one form or another, for about fifteen years. My interests started with Bulletin Board Systems. I had a dedicated dial-in in my home when I was in grade school and high school. There was a software platform called TriBBS available and I crafted what would have been equitable to a website sometime around 1990. I started to count the files people were searching for and started seeing other areas where they were coming from and building up my credibility as a site through those means. It was essentially my first foray into marketing and advertising. As the technology evolved, so did the methodology, and so did I. My job now seems like it was a logical progression in hindsight. Tell me about your work, education prior to your job in web analytics? Well, as we all know, nobody is offering degrees in analytics. So, I was forced to make decisions for education which most closely reflected my interests in hopes that somebody would pay me when I finished. I studied math, history, communication and psychology. I got degrees in several fields in the end and even continued education in Public Policy while walking the path close to becoming an attorney. After all that work, I ended up landing a job at an environmental company in Florida. So, for about 4 years, I spent time working in the field for a US Army Corp of Engineers contractor and sub-to –prime contractor for FEMA and the federal government. So how did you end up in Web Analytics? The real reason, despite needing financial compensation, was the fact that I met Paul Holstein – Co-Founder of CableOrganizer.com. Paul is a person who is passionate about web analytics and loyal to its role in creating a successful business. When we met, he explained the job functions and outlined for me an offer which would enable me to catch up on the learning I needed to be competitive, and he believed in me enough to give me the space I needed to develop. It's a great environment to work in and the job is rewarding on so many fronts that I didn't have to think about making the decision to join the team. How did you find your new job or met Paul? I think it was monster.com, I can't be sure though. I sent out a ton of applications. I mean a ton. It took me about 4 months to get the kind of offers I was interested in. I did have some other offers and plenty of interviews where I left knowing I wouldn't make another call. I don't know about everywhere else, but South Florida is pretty ripe with snake oil in all aspects of business. Paul and CableOrganizer fit the idea that I had for myself. They seemed to be very good people and the rest of the company was loaded with talent, diversity and intellect. It was a real breath of fresh air. What are you responsibilities in your current job? Describe your typical work day. I get up pretty early to see what the previous day was like. I look at the comparative traffic and use all of our available analytics tools to make sure things are running and populating correctly. I look into the campaigns, the new referrers, how search progress is coming along, etc. and then I start to perform path analysis to get an idea of what isn't carrying its weight. I run some engagement reports to see what pages are getting plenty of traffic but seem to be disproportionately bouncing. I then flag those in a queue to get them ready for optimization through testing scenarios. I spend some time developing elements as alternatives for testing. I look into the keyword reports to see if something is jumping out at me. We are now measuring keywords by bounce rate and profitability which has been a big help, so its consumed a great deal of my eye-time. In the end, I produce a weekly executive report and an insight report for the stakeholders. I've also been working on getting some departmental reporting and involvement to make the most of our program. Lastly, about twice a month, we schedule and run 3 usability tests and some multi-variable testing. All the progress from those is summed up in monthly versions of the reports mentioned earlier. A great deal of tenacity and being sharp enough to make the connection between right and left brain items. Like I said, I did some of the basics with this already. Knowing that, I just had to catch up to the technology and the methodologies. That wasn't easy, and I still feel like its moving ahead of me, but I think I have a pretty solid grip on the materials now. Do you feel any education or experience is lacking? Education or experience that would have helped. If anything is truly lacking, it has to be awareness to the value of analytics. It's the most fundamentally scientific aspect of business. People have a fear of things that they don't recognize or understand as being part of the deal, but its cast aside like witchcraft or astrology for a great number of executives still. Dave Eggers wrote in a book called "A Heartbreaking Work of Staggering Genius" , and I paraphrase, that we are the new model and the people with the power are often the old. Many times, in order to maintain the status quo, decision-makers will ignore evolution and advancement. Imagine walking into General Motors and saying "we should change the way we determine our designs based on these methods by Genichi Taguchi" twenty years ago. I'm sure Toyota was happy that they instituted his methodology. I own none. Paul's extensive library became mine vicariously and through an inter-office exchange. We have a bunch of really good material though. All of Eric T. Peterson's books are on the shelf. Then, there is a book called "Submit Now" by Andrew Chak, which is awesome. There is "Don't Make Me Think" by Steven Krug which is also very helpful. Then, there are the Dummies books etc. We have plenty of work on Search Engine Optimization and PPC and the like. I don't think any books helped. I think you just have to know your interests and be able to indulge them in a way that you can find value. For me, I felt when I got hired for this position that I wasted five years chasing money for somebody who didn't appreciate it. Now, I'm finding money and business, and discovering new science, for somebody who does. What were the major challenges you faced or are facing in your current job? The number one issue for my with my job is that Cable Management is difficult to dress up. It appeals to people who don't know that it appeals to them until they get the items and see what an impact our world has on them. Its neat though, because, it makes the challenge that much better. I have to find avenues to deliver people from isolated niches into our optimized landing pages. The information that I come across in the process can be really exciting and interesting. Sometimes, really useless when tested, but that's what this is all about. How do you make sure you are learning and growing in this field ? I attend more than my fair share of events on behalf of the company. I've been to New York City, Salt Lake City (for the Omniture Summit), Shop.org here in Fort Lauderdale, and to San Francisco for eMetrics. I also keep up on the blogs and the forums on analytics topics to see what new techniques are being refined. Its my personal position that a disproportionate amount of time is dedicated on some of these to pointing out problems with software or speculating on irrelevant or in-actionable insights. I find it frustrating too that certain parties use the venue to advance their tool’s position or beef up traffic for their own purposes. It’s the kind of thing that obscures the ability to use the web-group like an academic journal. I attend more than my fair share of events on behalf of the company. I've been to New York City, Salt Lake City (for the Omniture Summit), Shop.org here in Fort Lauderdale, and to San Francisco for eMetrics. I also keep up on the blogs and the forums on analytics topics to see what new techniques are being refined. Sadly, a disproportionate amount of time is dedicated on some of these to pointing out problems with software or speculating on stuff. Even more sadly is that from time to time, people infiltrate with the purpose of their own marketing etc. It makes it tough to appreciate the forum for its original intent. You are referring to web analytics yahoo group, right? Eric, I hope you are taking a note of it. Yes. I do have a blog. I've only started it very recently and have two posts nearly refined enough to let go. Its located at http://danalytics.blogspot.com. I will be publishing information with regard to analytics, usability and multi-variable testing, my experiences with software and some of the formulae which I have developed for our purposes. I'm sure when its realized, it may be useful to some folks in the industry. At least, I hope it is. I ams sure it will be. My advice…..hmmmmm, my advice is to understand the goals of the business first, then learn how to apply the practice of analytics. Further, know how to prioritize your information for the purpose of gaining more value from important analysis and leaving some of the more trivial analysis aside. For example, find ways to make money, save money and save time. Do that by managing keyword strategies, fixing problems, and optimizing landing pages. Sounds simple huh? Continuing my series of interviews with Web Analyst here is an interview with Ravi Pathak. Business Intelligence Associate at Trilogy Inc.
Tell me about your work, education prior to web analytics. In general,I did my Graduation in Business (MBA) prior to joining Hitachi in India. I worked as Business Analyst in Business Strategy Group. I was involved corporate budgeting. Measuring /Creating EVA standards of different businesses of Hitachi and some typical consulting projects like revenue forecasting, customer behavior analysis for new products. I worked as Equity analyst too for some time after that. It was more of accidental then, planned one. Well, It was interesting, I relocated to center of IT in India, then I got offer from Trilogy to work in Business Intelligence area. It took 2 months, for recruitment but Trilogy takes time and tries to find best. Since, I wasn't very sure what the web analytics is ( apart from measuring my traffic on my blog) , it was more of having critical thinking ability(as my manager now describes) then knowing all about website and usability. Measuring effectiveness of new functionalities, new releases, new pages on various KPIs. Creating dashboards for different stakeholders or our clients. Extended responsibility is to help creating data driven decision making culture. Being in sync with corporate standards for WA tool implementation. Specifically, my day starts with looking at all alerts email from WA tool. Assures me a cup of coffee (or a night out may be!!). Then I read bunch of emails from WA yahoo group, couple of blog RSS to see what's going on. Then more of day specific activities start. Currently its evaluating all tagging on different websites and writing specs, goals sheet to improve them and then ,creating stable reporting environment. Frankly, I have really had a hard time being able to generate huge no. of insights from data which should be the goal, but none the less we are making progress. Blogging helped. I used to blog about my equity analysis. Then someone told me about google analytics and I started using its basics. So, I knew basics what pageview ,visit, visitors is all about. Moreover, I was hired on the basis of having more business context in general rather then having typical web analytics background. I second this, knowing technology does helps, but knowing basics of business definitely helps to think through it web analytics. Having number crunching background also helped to look for any story that data has to tell. Moreover, We have a guy called Mark Coleman in different division at our clients place ,who is kind of mentor in all work we do, so having someone to guide us through is extremely helpful in web analytics where its easy to say, "I don't know", but hard to answer how would you know that?? I feel , I lack coding experience. Had I known basics of coding, I would have gasped technical issues related to my WA tool relatively fast. Prints collection of at least 8 blogs I read. Planning to own books by Jason , Avinash , Jim . 1. Culture of data driven decision making. I read blogs/Webs/Newsletters of following people Jim Sterne, Avinash, Eric, Gary , Anil , Stephen, Tim o'reilly, Jason, Matt Belkin , Steven Levitt etc. Also, sometimes, I browse thru old messages of WA yahoo group. If you don't have experience with web analytics, create a blog about anything and start measuring it. Knowing basic metrics are greatly helpful. Read as many blogs as you can on web analytics (above mentioned mandatory once). Also it is extremely helpful to read old posts. I have come of a belief that web analytics practitioners are very humble and helpful. You can ask all the people who have blog and they are super responsive. I would strongly recommend a book called Freakonomic to all analytics professionals in general .It tells what all data can really tell you! That's what we do right? Join WAA. It augments your networking and you can reach out to like-minded and extremely helpful guys out there. I wouldn't understate importance of networking. If one is new to web analytics, go to WAW(if you don't have a going on in your city-create one). What does word "Optimization" or "Website Optimization" mean to you? I asked this question a while ago on the yahoo web analytics group. The reason I asked this question was because I came across and article on Media post (Google Tries To Redefine Optimization ) where author was questioning the name of the tool that Google was calling “Website Optimizer”. According to the author “Website Optimization” means making sites naturally position well in Google and not a tool for doing multivariate or A/B testing. I thought I had a clear idea of what an optimization or Website optimization mean but after reading this article I was not sure if everybody has the same definition of Website optimization. Just do a search on Website Optimization on Google and you will see what I mean, you will find that this query yields paid searches from Search Engine Optimization companies, A/B Testing companies and company which allows optimizing load time of your site. The people responsible for different pieces of website optimization do not understand the complete picture and are locked in their own definition of website optimization. The writer of this article (Google Tries To Redefine Optimization) probably had SEO background and hence he had a different definition than a web analyst would have. I can see how then name Website Optimizer can be confusing to a lot of people since it covers only one aspect of website optimization. As a web analyst you should be aware of (and involved in) all the aspects of website optimization and only then you can develop a continuous process to improve the site. By being involved does not mean you have to actually do it but you have to make sure the web analytics data is driving the decisions. It should also be your responsibility to educate all stakeholders about how best to optimize the site based on the data. You have to act as glue, connecting different aspects of optimization. I intended to write this post a long time back but got caught up in other things and now finally I found sometime so there it is. I met a lot of them for the first time, we had exchanged emails or talked over the phone in past and it was nice to put a face to the name (Note: Most of pictures of these bloggers you see on their blogs and other sites are old. Disclaimer: My picture is old too, I will be posting a new picture soon). We had a table set aside for bloggers where we all got together over the lunch and talked about blogging and how we can all collectively make our articles and those from yahoo group readily accessible, in one place, for all those who are starting out in this filed (see my articles on Career in Web Analytics for example of types on content). As most of you already know by now, Eric Peterson announced that he left Visual Sciences to start his own company. When I saw Eric’s badge in the morning (Monday) it did not say “Visual Sciences” so I had a hunch that something like this might be coming but had no idea that he will be announcing it at eMetrics. I would like to congratulate Eric on his new venture and wish him the best. I will post more about my experience when I return back to Seattle. I run into lot of people who confuse web reporting with web analytics. Here is what I heard from one marketing manager when I asked her if she had a web analyst on staff - "Yes we hired somebody, she knows XYZ web analytics tool so I am all set, she will be pulling the data for us." What does this mean? Does knowing a tool and knowing how to pull data from that tool, web analytics? Send somebody to Omniture or WebTrends training and you can have a web analyst if that’s you definition of web analyst. Well that certainly was her definition and a lot of others that I have come across, I am sure there are lot of companies out there that have the same definition of a web analyst. In my opinion that is web reporting not web analytics. A person who only knows how a web analytics tool works and knows how to pull the data is doing web reporting not web analytics. Web Analytics however is different from web reporting and tools knowledge. While web reporting deals with “What Happened”, “When it Happened”, web analytics deals with “Why it Happened”, “What if it continues to Happen”, “Recommendation on what you should continue to do or change”. Web Analytics is way more than just reporting numbers. Note: Web analysts will soon have to get into predictive modeling to determine “what can happen in future”. Not a lot (read very few) companies are currently doing predictive analysis but it is coming soon. Web Reporting is like looking into a rearview mirror while Web Analysis (job of a web analyst) is about knowing where you are coming from, knowing your destination, looking into rearview mirror, learning from it, focusing on the road ahead and surroundings so that you can get to your destination safely and successfully. So are you doing web reporting or web analytics? Here is the latest update on “Web Analytics” jobs. This snapshot was taken on May 1st from Indeed.com and SimplyHired.com. These sites are job aggregators, they collect open job positions from individual company sites and from job boards such as hotjobs.com. SimplyHired.com also provide job boards called job-a-matic, like the Job Board I have on my blog. These job boards allow individual bloggers or site owners to quickly create a job board specific to their site’s content. Like last month, Indeed.com has more jobs listed than simply hired, but SimplyHired.com is catching up with indeed.com. It appears that either simplyhired.com is not aggregating more sites or companies are relying on job-a-matic job boards (see the example of the Job Board I have on my blog). Both indeed.com and simplyhired.com show an upward trend in open positions. Web Analytics jobs listed on indeed.com are up 4.5% from last month. On Simplyhired.com open jobs are up 14.7% from last month. “Web Analytics” jobs listed on indeed.com are up 68% from Jan 1st numbers. As I predicted in the beginning of this year, it is a very hot market for “Web Analytics” jobs so if you are on the sideline thinking about entering this field then this is the time. If you need tips on how to get started then read my article on Starting a career in Web Analytics, my series of interviews with web analysts and books recommended by web analysts. Overall job postings containing “web analytics” as a percentage of all the open job positions listed on indeed.com are shown below. To see which tools are in demand, I did some search on tool related job openings and found the Omniture was in lead followed by WebTrends. According to indeed.com, Omniture related open positions have jumped up significantly from last month and WebTrends related positions have declined. While, according to simplyhired.com omniture positions have declined and WebTrends positions are up. The net of this is that both of the tools are in high demand.